Most popular of the Greek heroes; son of Zeus and Alkmene, a Greek princess of Thebes, whom Zeus seduced by pretending to be her husband Amphitryon. 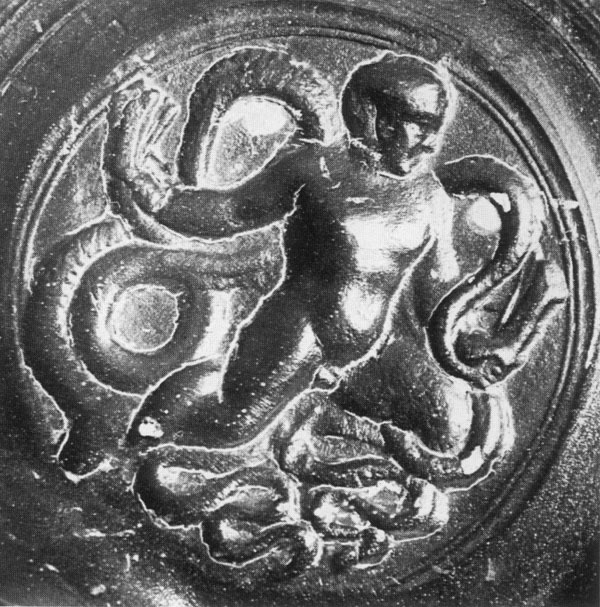 He proved his courage before he was even one year old, by strangling two snakes sent by Hera to kill him. He went on to accomplish Twelve Labours, imposed by Hera and performed in the service of Eurystheus, King of Argos, and to survive several other adventures (see under Acheloos, Alkestis, Alkyoneus, Antaios, Busiris, Chiron, Eurytos, Geras, Hebe, Hesione, Kerkopes, Linos, Philoktetes, Pholos (Centauromachy), Theseus, Triton). He led an army against the Amazons, in the course of which he also attacked and sacked Troy. Sometimes he attacked gods - Apollo for his tripod, and Poseidon. His companion was his nephew Iolaos. He served as a divine role model for humanity, succeeding through strength and courage, not magic; but he was regularly supported by Athena, and is shown with her so often in archaic Athenian sculpture and vase painting, that it seems that the pair symbolized the fortunes of Athens, later to be a role for Theseus. He eventually won admission to Olympos as a god and may be shown being introduced there, on foot or by chariot, but from the 5th century on this results from his self-immolation on a funeral pyre on Mount Oita. 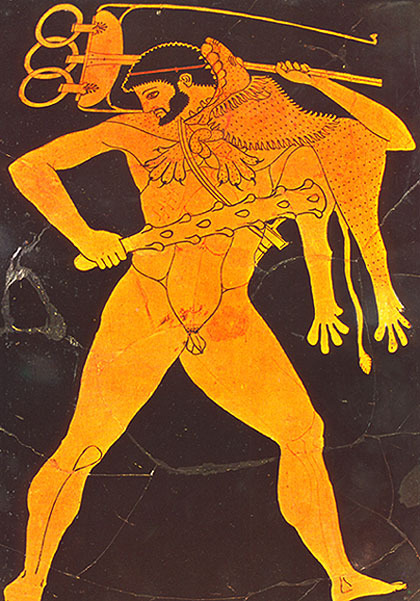 He wore the skin of the Nemean Lion (from his First Labour) and carried a club and bow; his cup is the kantharos. The sculptural type devised by Lysippus in the 4th century determined most later representations of Herakles (exemplified in the right hand image above).